What exactly does therapy entail? 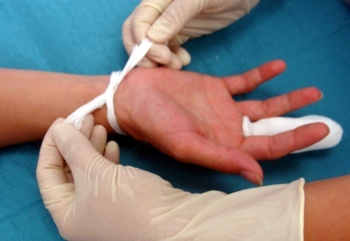 What kind of splinting can be used? How does a stax finger splint work? How many times does the stax finger splint need to be changed? How can one avoid cutaneous problems when using stax finger splints? What should you observe when changing the dressing / splint? What does the immobilization do? What else should be taken into account when immobilizing with a stax finger splint? What is the appropriate therapy on an extensor tendon rupture above a distal interphalangeal joint? In most cases extensor tendon ruptures above the distal interphalangeal joint are being treated without surgical intervention. This can be stated for almost all mallet finger injuries that do not involve bone fracturing. The injured distal interphalangeal joint needs to be brought into a stretched-out position with the help of a splint possibly shortly after the accident occurred (best within a few days after the injury). The image shows a stax finger splint which reliably ensures the immobilization of the distal interphalangeal joint. The period of immobilization should not be cut short. A time window of at least six weeks has proven to be successful. The immobilization in case of an extensor tendon rupture in most cases is achieved with the help of a stax finger splint. Should no stax finger splint be available in case of an emergency, it is possible to construct an immobilization device by using a small wooden stick. The wooden stick is placed underneath the proximal interphalangeal joint and the distal interphalangeal joint and is attached to the finger with the help of a band-aid. The mobility of the proximal interphalangeal joint should be retained. The stax finger splint has been specifically designed to immobilize distal interphalangeal joints. It is mostly applied to treat extensor tendon ruptures but also fractures to the distal interphalangeal joint that require conservative treatment. At first it may seem easy to apply a stax finger splint. Of course you could simply slip the stax finger splint over the finger and fixate everything with a band-aid. Individuals with sensitive skin will, however, quickly develop cutaneous problems with this form of dressing as the sweat of the finger against the plastic material of the stax finger splint may cause irritations. More often than not cutaneous problems are the main reason why stax finger splints are not well tolerated for the required period of time. 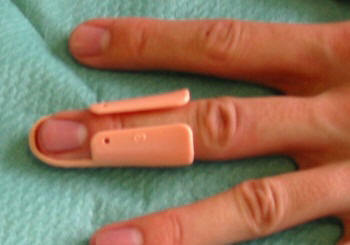 The image shows a stax finger splint being fixated with a finger cot. The finger cot is wrapped around the wrist. 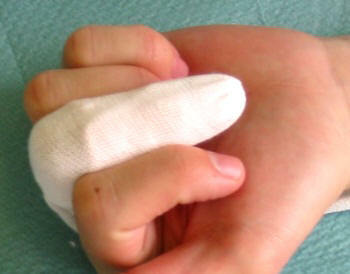 You pull a small finger cot over the affected finger and that will place a piece of fabric between the plastic of the splint and the skin of the finger. This form of dressing can comfortably be worn for an extended period of time. At first once a week the change of dressing / splint should occur under the supervision of a qualified professional (see image above). First of all it is of crucial importance to curb one´s curiosity. The biggest danger while changing the dressing / splint is the desire to test whether the extensor tendon has already grown back together. Bending and stretching the finger only two to three weeks into the recovery period will most likely result in the delicate newly-built scarring tissue to rupture between the ends of the tendon and the entire immobilization effort was invain. In order to avoid this it is of utmost importance to place the finger onto a table top or similar surface in a stretched-out position and to have an individual change the dressing / splint without bending the distal interphalangeal joint at any time! By immobilizing the affected joint in a stretched-out position the two ruptured tendon ends lay very close against each other. Similar to a bone fracture immobilized in a cast, scar tissue will start forming between the tendon ends to ultimately reconnect both tendon ends. The longer the immobilization lasts, the firmer the new connection of the tendon ends will turn out. It is very important to position the stax finger splint in such fashion that the mobility of the distal interphalangeal joint is restricted while at the same time maintaining full mobility for the neighboring proximal interphalangeal joint. A stax finger splint which also restraints the proximal interphalangeal joint, is always wrong! There is a good chance that a proximal interphalangeal joint which is immobilized for six weeks remains rigid. A stax finger splint is only adequately positioned if the proximal interphalangeal joint can be bend at least by ninety degrees!